Solar transients, such as coronal mass ejections (CMEs) and their related interplanetary (IP) shock waves, have severe space weather effects. Therefore, predicting their evolutions in the heliosphere and arrival times at Earth is an important component of space weather predictions. Recently, a new generation of physics-based predicting models for the shock’s arrival time, i.e. the Shock Propagation Model version 2 (SPM2), has been put forward by Dr. ZHAO Xinhua and Dr. FENG Xueshang from the State Key Laboratory of Space Weather, the National Space Science Center (NSSC), the Chinese Academy of Sciences (CAS). The SPM2 model is based on an analytic solution of blast wave theory in a moving steady-state medium with variable density. The inputs of the model include the observables at the disturbance’s initial time (initial shock speed, background solar wind speed, etc). And the outputs will provide an advanced judge concerning whether or not the corresponding IP shock will reach our Earth as well as the predicted arrival times if they could. The predicting results for as much as five hundred and fifty one solar-IP shock events in Solar Cycle 23 demonstrate that the overall prediction efficiency of SPM2 is better than other international prevalent models. Particularly, the SPM2 model has been developed to be an online-operation predicting tool. (http://www.spaceweather.ac.cn/groupmodel.php?group=sigma). Their work entitled Shock Propagation Model version 2 and its application in predicting the arrivals at Earth of interplanetary shocks during Solar Cycle 23 was published on the Journal of Geophysical Research (JGR): Space Physics 2014 VOL 119 hosted by the American Geophysical Union (AGU). Following that, Dr. ZHAO Xinhua presented an overall view of the present status of the space weather’s objective to predict the arrival of CMEs and their IP shocks at Earth, in collaboration with Dr. M. Dryer, the Emeritus professor in the Space Weather Predictions Center, National Weather Service of USA. They reviewed the essentialities of the arrival time prediction from the unique perspective of the forecasters, systematically outlined the international prevalent prediction models at present, with particular emphasis laid on the analytic physics-based models of SPM and SPM2 developed by the State Key Laboratory of Space Weather, NSSC, CAS. They also prospected the further direction of development of the arrival time prediction. As the chair of the international SOLTIP (SOLar connection to Transient Interplanetary Phenomena) project, as well as the first user of the term “space weather” (Advances in Space Research, 2006, 37, 1261), Dr. M. Dryer led a team to develop the “Fearless Forecast” prediction models. They are recognized as one of the most popular and influential modules in the shock's arrival time prediction. 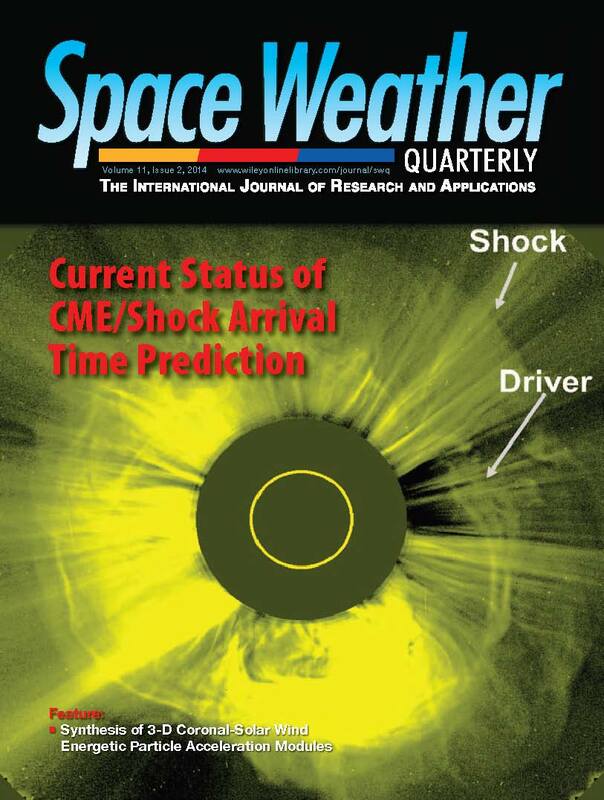 This work entitled Current status of CME/shock arrival time prediction was published on the Space Weather Journal 2014 VOL 12 hosted by the American Geophysical Union (AGU). It was also included into the second issue of 2014 of the Space Weather Quarterly, and put on the cover of both the monthly and quarterly journals. All of these demonstrate that the arrival time prediction models developed by NSSC scientists have become international hits.